Fitness equipment can run anywhere from $50 to $5,000 or more. If your workout consists of more than just jogging, at some point you'll want to invest in some fitness equipment. Which you select will, naturally, depend on lots of things - budget vs price, quality vs needs, type and interests and so forth. Fitness equipment can run anywhere from $50 to $5,000 or more. You may be satisfied with an exercise ball or you may want a complete gym. That depends, of course, on your budget, your commitment and your desired workout routine. 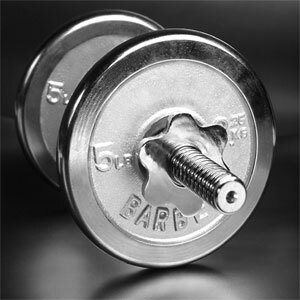 A few free weights might be a good start if your preliminary goal is to tone and build muscle mass. A quality bar for chin-ups and pull-ups would be a good addition to a basic set. Between floor exercises and some elementary weight lifting, combined with chin-ups or pull-ups, you can design a varied workout. It's always a good idea to have a longer-term plan, though. Buy higher quality today, equipment that lasts and that will continue to be part of your routine for several years. If you're considering an exercise bike, for example, in order to do some spinning for a great cardio workout, get something solid and reliable. You want the bike to be good for at least five years. Make sure you take into account how much space you have, and how much you're likely to have for the next few years. For a bike you need only about 10 square feet, but a treadmill will require 30 square feet. A multi-station weight machine may take up to 100 square feet or more, depending on the design. If you're just starting out, test a variety of equipment from different manufacturers at multiple outlets. Several companies make high quality gear, but every person is an individual. That means that a machine that works great for one person may be unsuited for another. A rowing machine that fits your tall friend may be useless, or actually harmful, for you. Get equipment that's adjustable to fit your body size and type. That also helps when and if you share the equipment with a partner. Make sure the adjustments - for tensions, lengths, weights, etc - will travel through a wide range. As you build strength and endurance you'll want equipment that continues to test you as you develop. Make sure you, and anyone who shares it, can use the equipment safely. Multi-station weight machines have safety features that vary in style and effectiveness. Pick equipment that suits you, not the salesperson. From some advisors, 'no pain, no gain' can mean 'you should feel some pain'. Some mild discomfort the day after is normal and expected. But if it hurts you to use the gear, either you're doing something wrong - and should get guidance about proper technique - or the equipment isn't right for you. You should feel comfortable using it. For example, walking machines should have rails that suit your height. They should also have rollers and settings that you can operate properly while in motion. Weight machines should have a chair and handlebars that you can sit in and grab without straining and don't produce back or neck aches. Shop around, ask a lot of questions and don't buy until you are satisfied that you've found something that will last and suits your unique style.